Many authorities have suggested using a VPN (Virtual Private Network) to protect your privacy. In general, I do not recommend a VPN to stop tracking or improve privacy. I do recommend using one for security while traveling. I use a VPN service on my tablet and phone for use when connecting to WiFi at restaurants or hotels. A good service can be very inexpensive privacy and security protection while out of your home or office. VPN means Virtual Private Network. Essentially a VPN service is letting you join their theoretically secure private network and do your Internet actions from there. 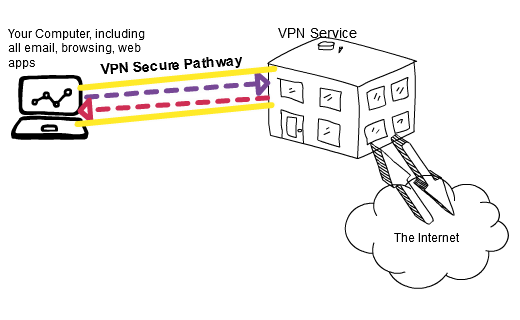 A VPN Service makes a secure connection between your computer and the servers at the VPN service. In many ways, it is as if you were on the same network as they are on. The service will handshake with a companion application on your computer where the application and the service each verify their identities and agree on a solid encryption protocol. They then setup a solid impenetrable tunnel that all your Internet applications will use. Until you disconnect that tunnel, the only thing your ISP, or anyone else can see, is that you have a connection to the VPN Service. Nothing inside the tunnel is visible. Besides verifying your identity, and preventing snooping, the VPN will insure that the message is not altered. A browser can form a secure connection with your Bank or a store for purchases, but that is just a secure connection for that tab in that browser session. I recommend Tunnelbear. I've written about it here. There are many good VPN providers, but even more bad ones, so be careful. You are trusting that VPN service with all your Internet traffic. A VPN will slow you down, and Netflix will try and block watching movies with it. Some stores will prevent you from making purchases as they see the use of a VPN to hide your location as a possible indication of credit card fraud. In general, the VPN service will not protect you from trackers or malware ads on websites. It will not protect you from search engine tracking. It will disguise where you are going from your ISP but will reveal what you are doing to the VPN service. If you trust your VPN service more than your ISP, then that is a small level of protection. If the ISP installs tracking software on your phone or computer, then the VPN service protection can be bypassed. I strongly recommend using a VPN service on laptops and tablets when traveling. It provides protection from open WiFi networks and hacked routers at restaurants and hotels. However, it seems like a bit too much hassle for too little protection from your ISP. However, if you use one, be sure and get a good one that is more trustworthy than your ISP and that will not oversell their capacity. If they oversell their capacity, your Internet speed can drop to pre-broadband levels. Exactly how can you figure out if a VPN is trustworthy? You can't. A recent study of Android VPN services offered on the Google Play store found that 75% of those offering privacy protection were actually tracking you themselves! Some of them didn't even encrypt your traffic while others appear to be malicious. However, you can get clues by checking the length of time in service, quality of product (does it look good? ), and reviews. Another indication is whether they support privacy projects and fight attempts to spy on you. Do not just pick a cheap one. They have to make enough money to not need to sell your data or skimp on the speed and number of their servers. These companies must conform to the laws of the country they are in. So, I recommend not getting a service whose major office in the United States or England as their privacy laws are suspect. Tunnelbear is in Ontario Canada which does a better job of protecting privacy. The VPN service will usually comply with the laws in their own country.